Duane Beeson was born in Boise, Idaho July 16, 1921. He attended Garfield Elementary School and Boise High School. He was typical of many youngsters, a Boy Scout, liked to box, loved music, and played both the trumpet and the piano. He was active in the R.O.T.C. and marching band. He was a good student, his major interests were in history, politics, and law. After graduation from Boise High School in 1939 he left Idaho to live with his mother’s sister in Oakland, California, where he worked at various jobs and eventually enrolled at the University of California’s Law School. His tenure there was short lived, however. With the war in Europe escalating, he knew it was only a matter of time before the United States would become involved. He wanted to fly and the U.S. Anny Air Force wanted pilots. One of the prerequisites to becoming an Army Air Force cadet was a minimum of two years of college, which Duane did not have. He discovered that he could enlist in the R.C.A.F. and become a flying officer if he finished his training in the upper third of his class. In June of 1941 he enlisted and began intensive training as a flying cadet. He received his wings in February of 1942 and after a short leave spent with his parents in Boise, Idaho was sent to England where he began flying the high performance Hawker Hurricane. The ensuing months were spent in perfecting his abilities as a fighter pilot. On September 15th he was assigned to the First American Eagle Squadron No. 71 and began flying Spitfires. On September 23rd, the three Eagle Squadrons were transferred to the U.S . A. A. F. and became activated as the 4th Fighter Group. His first combat experience was in the P-47 Thunderbolt and eventually was phased into P-51s. In the months that followed he became the second highest scoring ace in the E.T.O. On April 5, 1944, while making a raid on Gardelegen Airdonx, he was hit with antiaircraft fire. 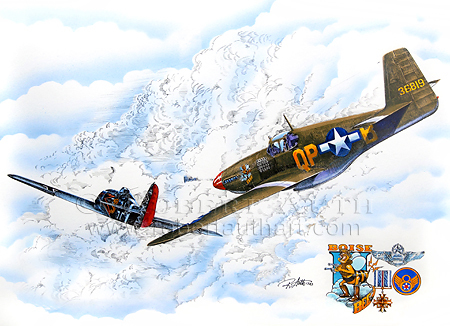 He bailed out of his damaged P-51 and was taken prisoner. He spent the rest of the war in Stalag Luft No. 3 at Rostock, Germany. As the Nazi war machine collapsed, he was repatriated and returned home. He was eager for reassignment to the Pacific, but was never again sent into a theater of war. Duane Beeson, at age 25, died of a brain tumor and was buried in Arlington National Cemetery on 19 Feb, 1947. His victories numbered in excess of 24. His awards included the D.S.C., the D.F.C. with five clusters, Silver Star, Air Medal with five oak leaf clusters, Purple Heart, Belgian Croix De Guerre, and various theater medals. This print was developed as a memorial to a Boisean who believed strongly in the moral aspects of what he fought for. Duane Beeson was a hero, patriot, and a great warrior.